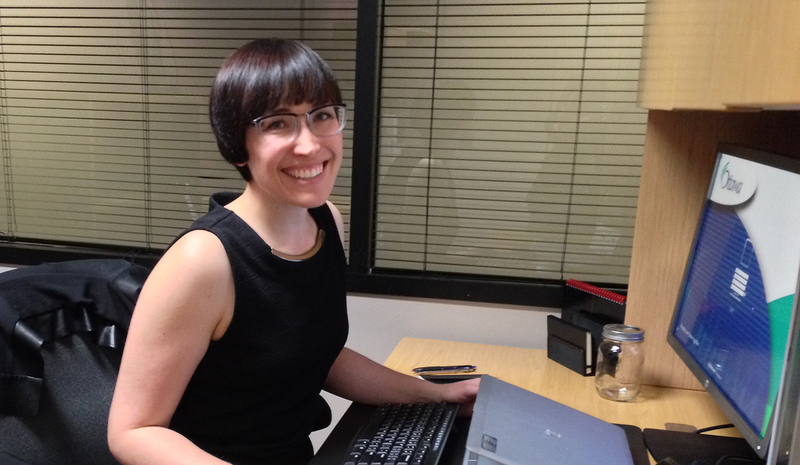 Ward Office: meet Katie Bonnar! Home / Ward Office: meet Katie Bonnar! So far, we've been divvying up topics as they arise (and, boy, do they ever flood in!). I've become very familiar with a lot of the community-led groups who are pushing for positive change in the ward as well as the LRT and developments. I'll be handling the Planning Committee file for the office, which means I'm logging lots of face time with city planners, private developers and interested residents. Some of the younger ward residents will recognise me from my years as a manager at a popular (closed) Westboro confectionery, but most recently I'd been working with Givopoly, a local online gift concierge service, helping connect small, independent businesses with new customers. I also spent a chunk of last summer and fall in Jeff's campaign office. In 2012 and 2013, I had the fantastic experience of living abroad, with my husband, in London, England and when we returned in 2014, we moved right back into our little home in the Hampton-Iona area. Going even further back, I'm from Oshawa, Ontario and came to Ottawa for school (Ottawa U - Classical Studies/Visual Arts). I'm a former go-go dancer for a local surf band and a retired roller derby player. The band (The Reverb Syndicate) still plays, but I hung up my go-go boots after our last UK tour. And my lovely roller derby league (The Rideau Valley Roller Girls), of which I was a founding member, is still skating hard and climbing the world rankings. A more current surprising fact would be that although I adore spinning classes, and own two bikes, I haven't ridden a bicycle in at least six years. I've been a bit intimidated by city cycling - and that's my 2015 goal: to get on my bike and ride! One of my favourite things about Kitchissippi is just walking down main thoroughfares. Or popping into shops/cafes and running into friends and acquaintances - there's always someone we know just wandering around. With so many areas for relaxing, we're always up for a quick catch-up chat or an impromptu hang out...though a little less so in the winter than summer! Another of my Kitchissippi favourites is our independent shops and cafes - I love that I can walk along Wellington/Richmond and support so many local businesses. It's such an important economic factor for the community and something I think is worth cherishing. There have been a number of awesome "wow" moments, but the one part about this job that has made it so fabulous is my colleague Susan Ong! We met once prior to starting, but that was enough - we got each other right away and we've developed a great working friendship. She also happens to be a lot of fun and a fabulous cook! Much like Susan, I don't know if I'd claim to be able to solve problems, but I can do everything within my power (with a little creative thinking) to try to help. I remember back to my own experience with a councilor's assistant years ago - I was on the other side, requesting help and due to the nature of the issue there wasn't a whole lot that could be done. But what mattered was that I was heard and supported. I should hope that I can provide that same sense of caring and support, even if the outcome cannot be affected or is not one that was desired. Be specific and be concise please. That's definitely the biggest piece of advice for contacting us. Also helpful: please get more voices involved. If you want to get something changed that affects either a number of residents or a whole community, but there's only one request, it can be harder to make a meaningful case. If a whole neighbourhood, however, either working collectively or through their community association, makes their concern known, it can sometimes be the evidence we need to exact change. For instance, if one person wants the parking designation changed on their street, they're one voice, standing alone. But if an entire street approaches us and says they'd like their parking designation changed, it's much easier to make that happen. Talk to your neighbours - drum up support - and we can make things happen!